Marketing your small business can be challenging, especially since what works for one business doesn’t necessarily work for another. All you can do is strive to find the best ways of internet marketing your business. Fortunately, there are a few things that work for almost any business. 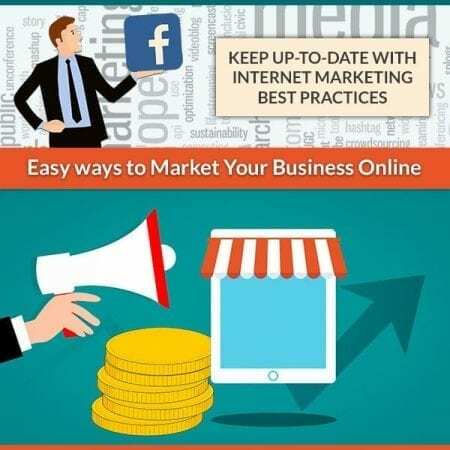 Before getting started make sure you establish what you want to get out of your internet marketing – more customers, increased traffic, better brand awareness, all three. While you may have a large goal here, make sure you set small ones that help you reach this big goal eventually. You’ll want a goal to reach each week, then add some structure to these goals so you’re sure to succeed. There’s a lot of content to choose to read today. People are becoming overwhelmed and only choosing to listen to those who are authorities in their topic. To get people to visit your website you must show them that you have an intimate understanding of their issues and knowledge of the best way of solving this issue. You can establish yourself as an expert by continually posting helpful, informative posts on your blog. You can’t simply own a website and not do anything with it. Instead of neglecting your website, make sure you continually check to make sure it’s operating smoothly. When checking on this, you should also make sure it’s optimized so that search engines can easily find it and share it with their visitors. Once your website is SEO optimized, it’s time to find internet marketing methods of attracting people to your website. Fortunately, there are many ways of doing this (e.g. social media, email marketing, video marketing). With so many internet marketing available for use today it’s easy to become overwhelmed. This is why you should only start with a few strategies. Once you get a hang of them you can add additional ones. Make sure you don’t just use multiple channels, but that you integrate them into a coherent system. You can even integrate some of your offline marketing techniques here. For instance, make sure you spread the word about your email list on social media and include your social media handles in your marketing emails. Use keywords when you write descriptive, unique content. Make your website easy to navigate and mobile friendly. Always include clear calls-to-action in all your writing. Post 80% non-promotional content when using Facebook. Don’t use spammy words (e.g. free) in your subject line. Have a clear unsubscribe option in all your newsletters. There’s a lot of work to be done here. As a business owner you’re probably already quite busy. Fortunately, there’s someone you can turn to for help – the Local SEO Company. Over the years they’ve helped many brands succeed and there’s no reason yours shouldn’t be next.